Solzon Corporation offers an array of rugged, vehicle-mount computers designed specifically for the rigors of harsh environments. Each unit is engineered specifically for mounting onto forklifts, pallet jacks, hostlers, and over the road vehicles. Solzon Corporation understands the demands a data collection device must meet and commits to providing vehicle-mount units capable of running 24/7 in any environment. Each device is built to meet or exceed MIL STD 810F standards and is ideally suited to environmental extremes including temperature, moisture, vibration, shock, and airborne contaminants. Every vehicle-mounted rugged computer Solzon offers is designed for high performance operation. 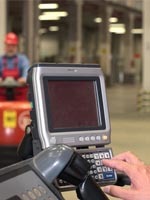 Solzon Corporation provides vehicle mounted computers to an array of industries and applications within those industries. Our areas of deployment expertise include warehouses, distribution centers, factory floors, freezers, and freight terminals. Common applications include picking and putaway, inventory control, cross docking, yard management, and work cell replenishment. Our value doesn’t end at the vehicle mounted computer however. Solzon Corporation offers consultation and solution support throughout the process. We offer integration, installation, wireless and software support services. As your partner, we’ll provide the right hardware solution and couple it with our industry knowledge to insure you begin maximizing efficiency right away.